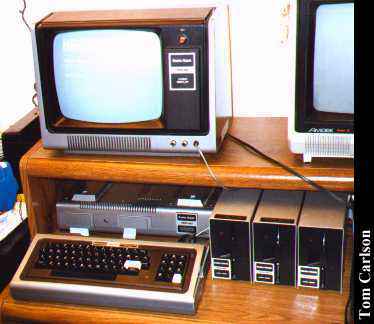 Tandy/Radio Shack's first PC. The Model 1 came with 4Kb RAM standard. The built in Basic, called Basic Level 1, was extremely limited. It had only 26 possible variables, labelled A-Z of course, and one and only one integer array variable, called A(). The monitor was basically an RCA TV with the tuner removed. Storage was on cassette tape. 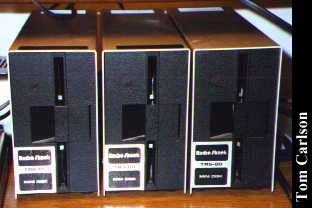 Most Model 1s were upgraded to 16Kb and Level 2 Basic. Additional expandibility was gained through the Expansion Interface. This fair sized box connected to the back of the Model 1 via a short ribbon cable. 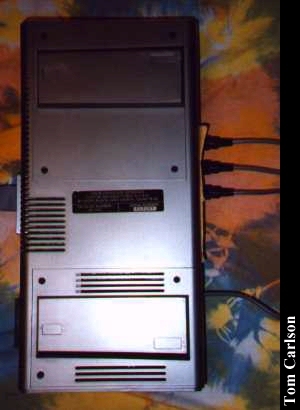 The monitor then sat on top of the Expansion Interface. With an Expansion Interface, you could add additional memory, control serial devices, use two tape decks instead of just one, and control up to four floppy drives. This particular Model 1 has 16KB RAM, an Expansion Interface, and three floppy drives. One floppy isn't quite working and the monitor crackles like a bowl of Rice Krispies, but the system works great otherwise. 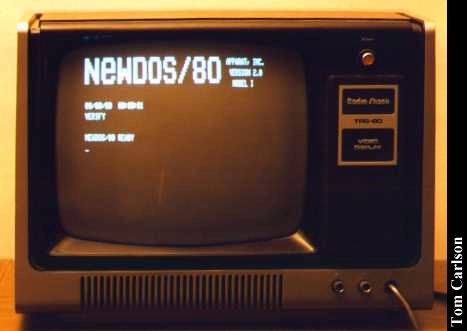 There were a number of DOSs available for the TRS-80 family. Tandy/Radio Shack's TRSDOS was generally regarded as being pretty crummy. Third-party DOSs were much more usable. This particular Model 1 came to me with both TRSDOS 2 and NewDos/80, one of the more popular third-party DOSs. 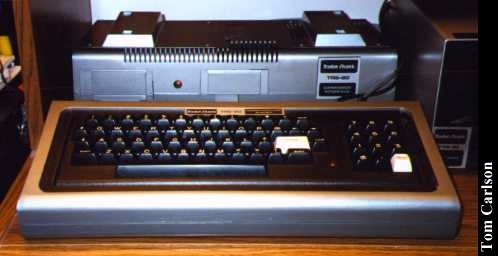 This particular Model 1 also came with a Pascal compiler, a COBOL compiler, and loads of games. The games are very good and very playable, especially considering the limited graphics available. Click here to view all comments for the Tandy TRS-80 Model 1 and to leave your own.